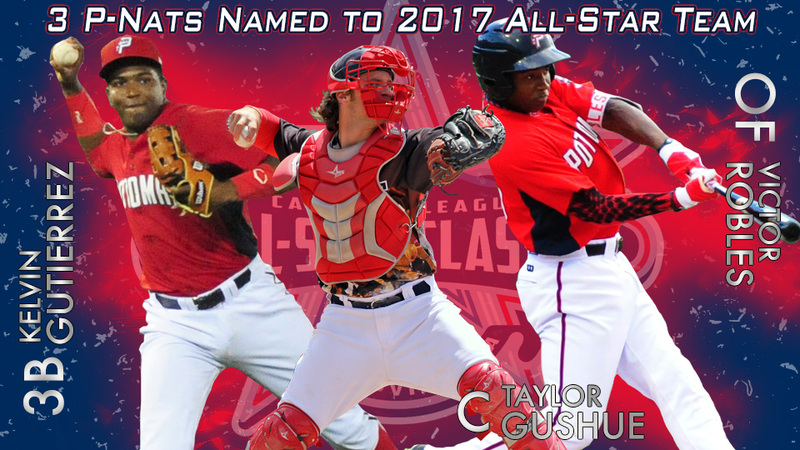 Woodbridge, VA---The Potomac Nationals are proud to announce that CF Victor Robles , C Taylor Gushue , and 3B Kelvin Gutierrez have been named to the 2017 Carolina League Mid-Season All-Star team. These three players will represent the P-Nats and the Northern Division in the 2017 Carolina League All-Star Game at Haley Toyota Field in Salem, VA on Tuesday, June 20th. At just 20 years old, CF Victor Robles is the youngest player on Potomac's roster. The Nationals' top prospect showcased his skills throughout the first half despite a stay on the disabled list for the final few weeks of April. Nevertheless, the 2013 international signee showed why he's the top ranked prospect in the system and a consensus top 10 prospect in all of Minor League Baseball. Through his first 47 games in 2017, Robles is batting .283 with an on-base percentage of .380. At one point in the first half, Robles reached base in 17 consecutive games. Robles has six home runs, tied for second on the team, and has tallied 21 total extra-base hits. His 11 doubles are tied for the team lead. The centerfielder drove has driven in 19 runs in the first half and stolen a team-high 11 bases. His speed is his biggest asset and has translated over to his defense, where he excelled throughout the first half. Robles leads the P-Nats with eight outfield assists in 2017 and a .993 fielding percentage. Listed as a five-tool player, the 20-year old proved that he is All-Star game worthy and will show off those tools next Tuesday in Salem. C Taylor Gushue found a new home with the Washington Nationals in 2017 and has impressed on many levels. Drafted in the fourth round of the 2014 MLB Draft by the Pittsburgh Pirates out of the University of Florida, Gushue was sent over to the Nationals this past offseason in a trade for INF Christopher Bostick. The 23-year old proved himself as the best offensive power threat in Potomac's lineup through the first half. Gushue has hit 12 home runs and driven in 47 over 45 games in the first half. His home run total is currently second best in the Carolina League, while his RBI total places him third amongst the league leaders. The 23-year-old has two multi-home run games in 2017 and hit a round tripper in four consecutive games over his first six games with The Red, White, & Blue. Gushue has helped the pitching staff tremendously, as the P-Nats currently rank fourth in the league in ERA at 3.66. 3B Kelvin Gutierrez also earned a Mid-Season All-Star nod. The 2013 international signee has dazzled on both sides of the ball. He is a sparkling defender at third base and is the most consistent bat in the P-Nats' lineup so far this season. Gutierrez is Potomac's current leader in hits, with 64 over his first 58 games this season. He also leads the team in triples (6) and has compiled 18 hits for extra bases. His stellar defense and elite level arm has led him to 57 games at third base so far five errors this season. Gutierrez proved he is amongst the Nationals top prospects and is selected for an All-Star team for the second consecutive season. He was a Mid-Season All-Star in the South Atlantic League in 2016. Salem manager Joe Oliver will manage the Carolina League All-Stars from the Northern Division. Myrtle Beach's Buddy Bailey will head the Carolina League Southern Division All-Stars. The 2017 Carolina League All-Star Game takes place on June 20th at Haley Toyota Field in Salem, VA. The 2017 All-Star game marks the first season that will not include the California League in All-Star festivities. For tickets or more information, visit salemsox.com.